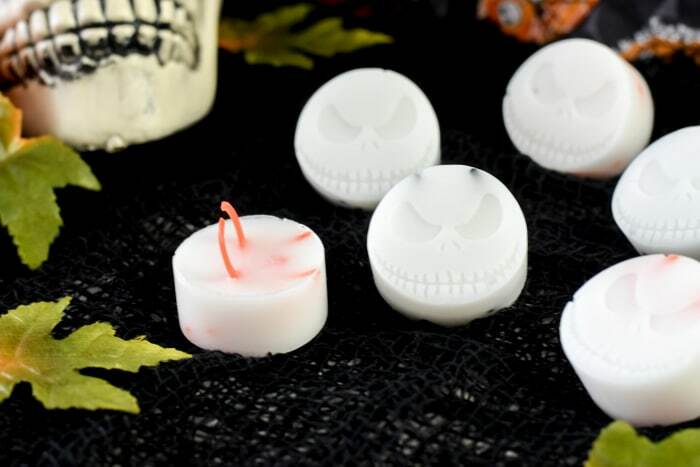 Jack Skellington Soap Rings | People will ask, "What's This?" It’s almost Halloween and nearing when our baby is born. 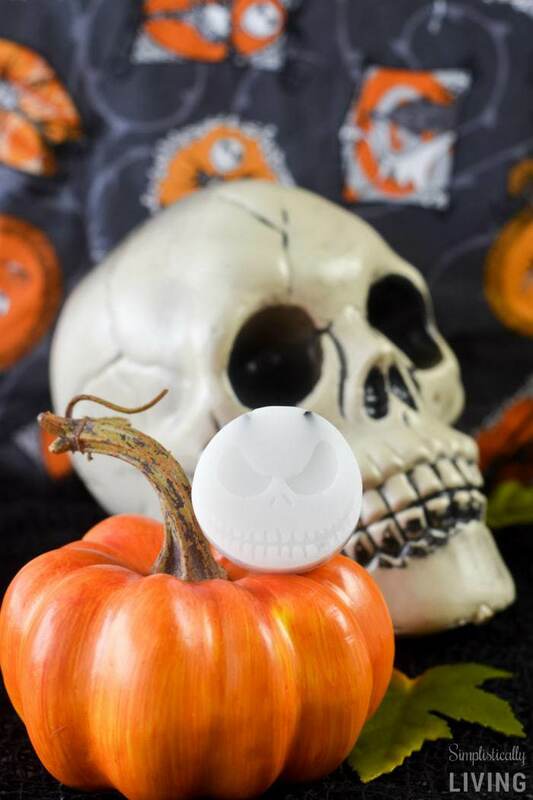 With all that is happening, we wanted to make some super spooky Jack Skellington Soap Rings that served as a fun party favor at our baby shower. And, they turned out awesome! 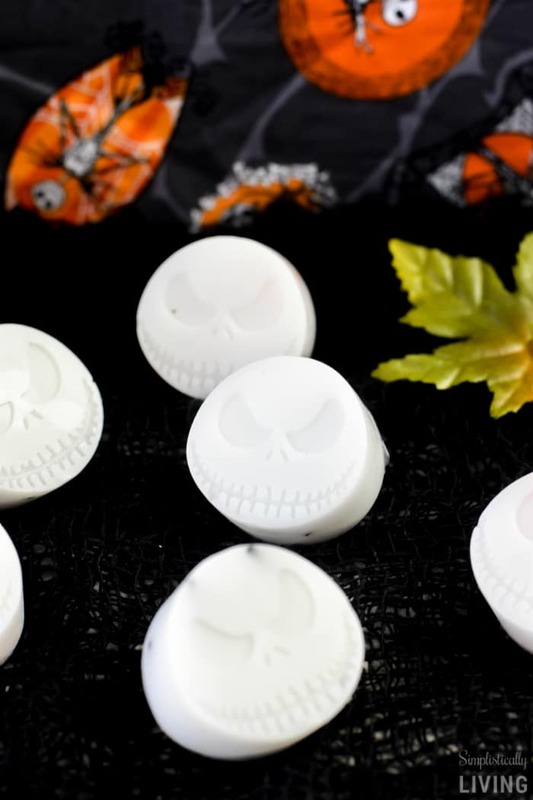 Now that I have that song stuck in your head, I am sure you are so excited to make these super cool looking Jack Skellington Soap Rings, right? 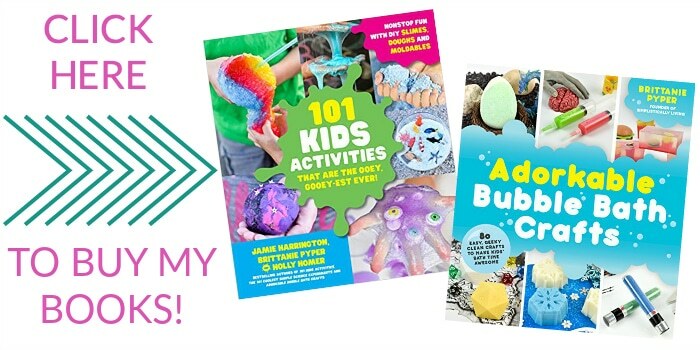 The soap gets really hot so if you are having your little ones help you, please make sure to assist them pouring the melted soap so they don’t get burned. 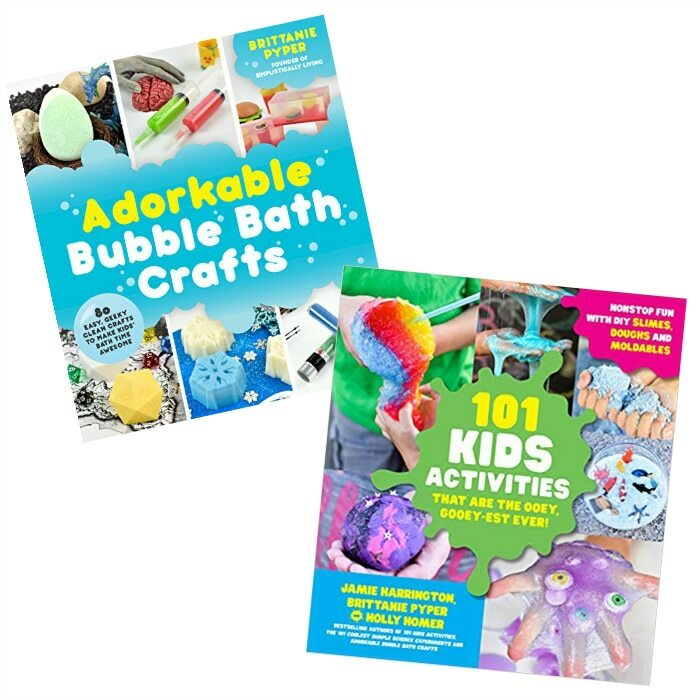 These soaps can be used immediately after they have hardened. This recipe calls for skin-safe fragrance oil. You can use essential oil instead just ensure it’s skin-safe and not the kind you purchase by the candles. First, start by cutting your soap. You want to make the soap into cube shape so it melts evenly in the microwave. Place the cut soap into your microwave safe measuring cup. 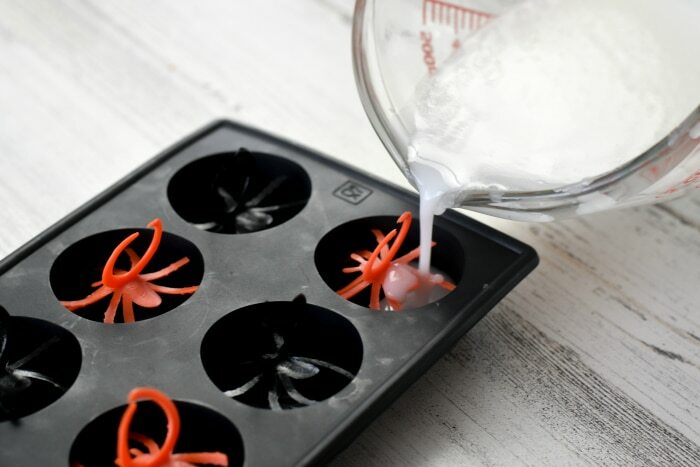 Now, place your silicone mold onto a hard surface. I like to place mine on the top of the cutting board. 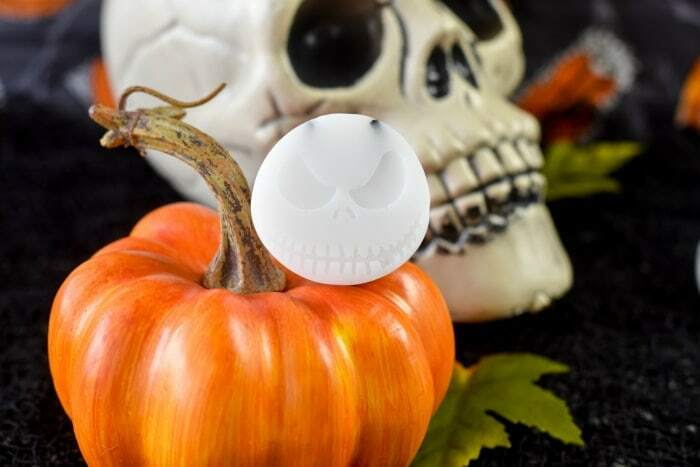 You don’t want the silicone mold moved after you pour the soap or it will cause the soap to harden unevenly. Next, heat the soap in the microwave for 30 seconds. Remove and stir. Do this until the soap is melted entirely. Be careful not to burn the soap. Add a few drops of your fragrance oil and stir well. You truly only need a drop or two as fragrance oils tend to be a bit potent. Add your spider rings into each cavity of the mold. Note: The spiders may be too big for the molds so you can clip off the ends of the spider legs to help them fit into the mold. 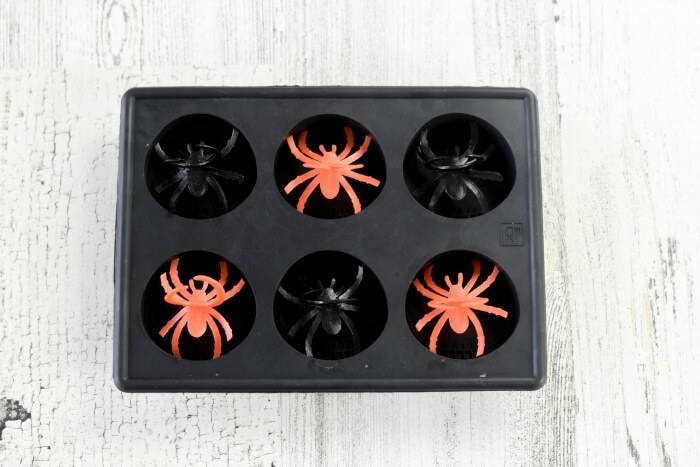 Now, carefully pour the melted soap into each mold covering the spiders entirely. Spray the tops of the soaps with the rubbing alcohol so you remove any bubbles that float to the surface. Allow the mold to sit untouched for several hours and then you can press gently onto the back of the mold and release the soaps. The last thing to do is wrap your soaps. 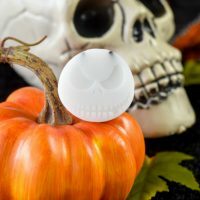 You want to make sure they are entirely covered from the air so the soap stays good and is free from humidity. Soaps can be used immediately or stored for several months.